Hennessee Group - What is a Hedge Fund? "Hedge fund" is a general, non-legal term that was originally used to describe a type of private and unregistered investment pool that employed sophisticated hedging and arbitrage techniques to trade in the capital markets. Today, the term "hedge fund" refers not so much to hedging techniques, which hedge funds may or may not employ, as it does to their status as private and unregistered investment pools. Unlike mutual funds, hedge funds are not required to register with the SEC under the Investment Act of 1940. In addition, hedge funds will typically have both a management and performance fee component, and managers of hedge funds will typically have a significant portion of their personal net worth invested in the fund. Unlike private equity funds, hedge funds generally invest in liquid securities and provide relatively liquid redemption rights to investors. Hedge funds may utilize leverage and use derivatives in constructing portfolios. Hedge funds are subject to antifraud provisions of the federal securities laws. The use of the term "hedge" in the United States originally was coined by the agriculture industry. Farmers were the first "hedgers" by selling crops or cattle yet to be harvested at a predetermined price for future delivery. In doing so, they locked in a price today and were "not exposed" to future market fluctuations. The early hedge funds pursued a similar strategy of selling equities short to reduce or eliminate the exposure to future market fluctuations created by being long equities. The hedging strategy centered around equities on the "long side" outperforming during up markets while the equities on the "short side" did not create a drag on performance. It was possible that the short side would even add to the portfolio’s return since there are always stocks that lose value, even in a bull market. In a market correction, the short portfolio was intended to outperform the long portfolio or at least "hedge" and reduce the decline in the portfolio’s value. Long before hedge funds arrived, investment banks began trading stocks and bonds in a "long/short" platform for their own account (i.e., proprietary trading). The industry has grown tremendously since the 1950's, when the first hedge fund partnership was introduced utilizing short selling and leverage together with a performance fee. Today, the hedge fund industry has approximately 9000 funds and more than $1.8 tillion dollars in assets under management. 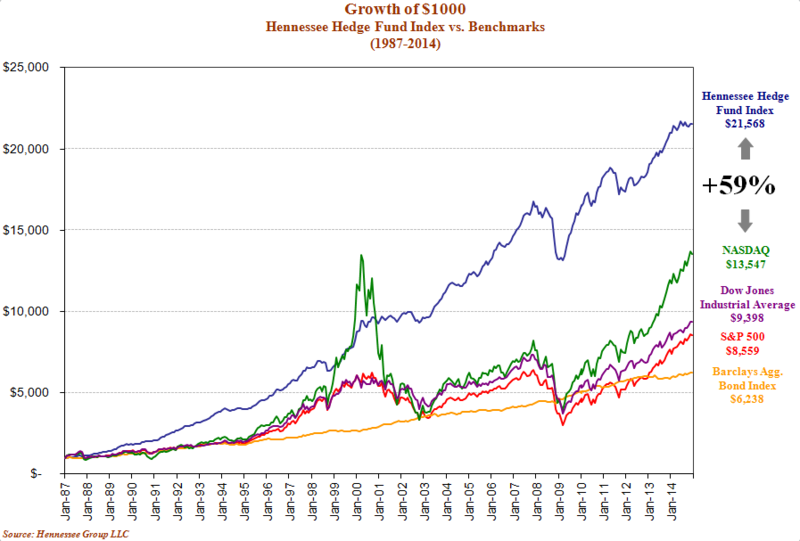 Why Invest in Hedge Funds? 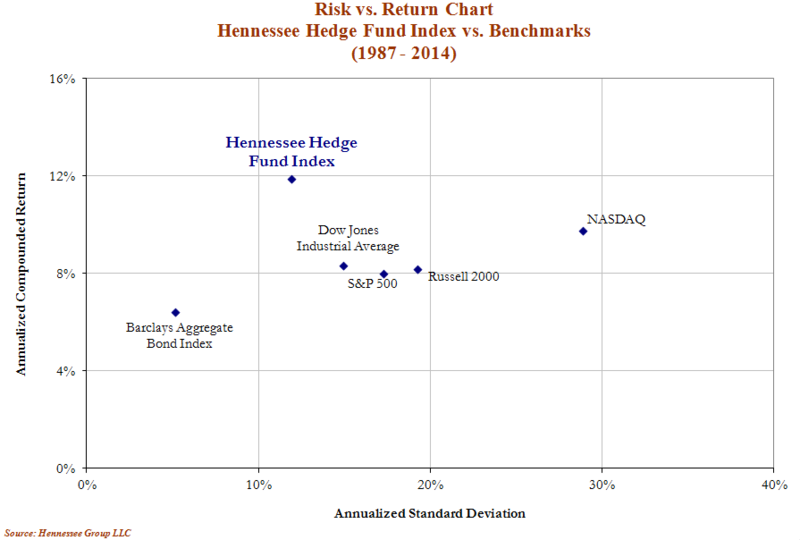 Hedge funds have historically outperformed benchmarks on a risk-adjusted and absolute basis (graph 1). Hedge funds have historically shown ability to perserve capital in down markets (graph 2). Historically, the ability of hedge funds to outperform on a long-term basis and to limit downside losses has allowed hedge funds to generate superior long-term gains (graph 3). Past performance may not be indicative of future results. Whether your investment objective is conservative, moderate or aggressive, we believe in the importance of a diversified portfolio of hedge funds. By combining various hedge fund styles that incorporate many asset classes, sectors and markets worldwide, investors can gain broad exposure to investment opportunities and risk management techniques not generally available within a traditional investment portfolio (e.g. mutual funds and "long only" money management). A properly diversified and managed hedge fund portfolio can provide superior investment returns with significantly lower portfolio risk in comparison to traditional equity portfolios. How can I invest in Hedge Funds? For more information on how Hennessee Group LLC can assist you with constructing and monitoring a hedge fund portfolio, please view our company profile or feel free to contact us at (212) 857-4400 or at hennesseegroup@hennesseegroup.com. 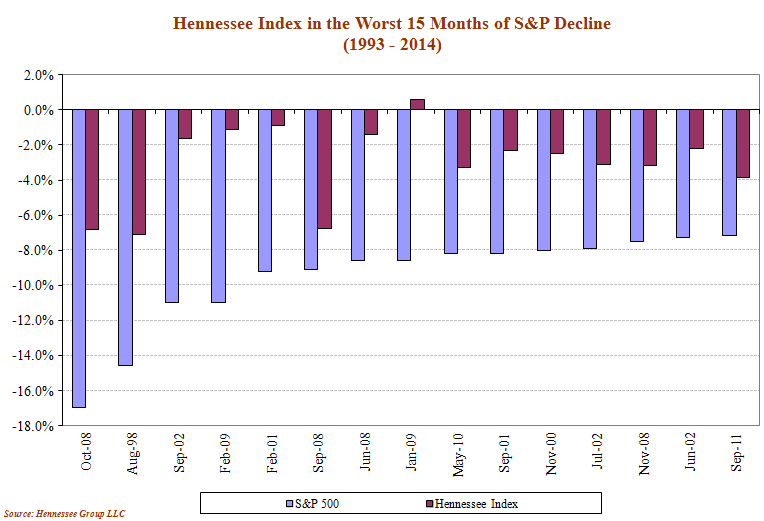 * The Hennessee Hedge Fund Index is not intended to represent the performance experienced by Hennessee Group clients. � 2012 Hennessee Group LLC, All Rights Reserved.